Left to right: Maj Harris, Capt Poirier, SLt Leblanc, and CPO2 Tucker. 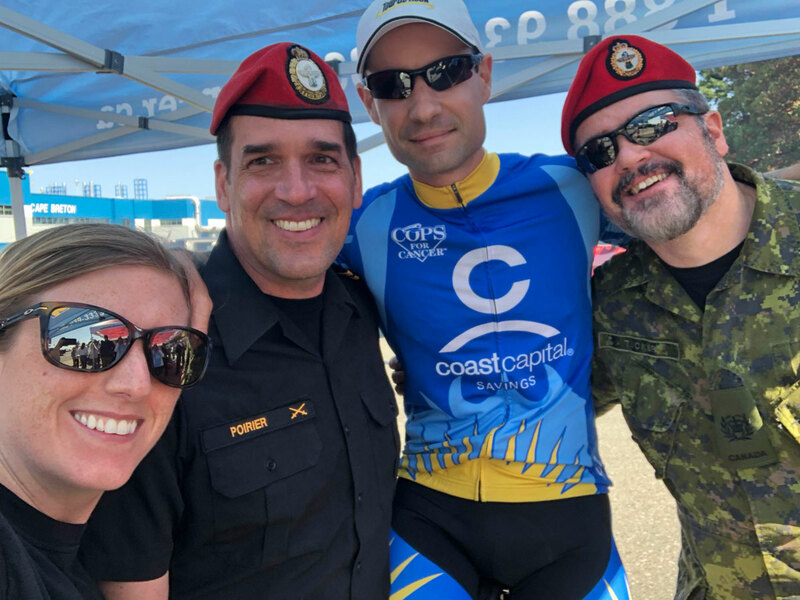 Military Police (MP) Officer SLt Antoine Leblanc, Officer Commanding Canadian Forces National Investigation Service (Pacific Region), has raised over $4,000 for pediatric cancer while training for the Cops for Cancer Tour de Rock ride in September. Over the last few weeks, SLt Leblanc has participated in two spin-a-thons, most recently at the Quality Foods in Langford with paramedic Greg Stubbs where he spun over 50 kilometres. The previous spin-a-thon and barbecue, which took place at CFB Esquimalt with firefighter Matthew Arnsdorf, raised $2,400. SLt Leblanc enjoys the spin-a-thons because it not only raises funds, but it also helps raise awareness of pediatric cancer and Tour de Rock, the seminal event of the Cops for Cancer charity on Vancouver Island. He admits they could just be standing behind a table or doing a barbecue, but Tour de Rock is a cycling journey, so they spin. “It is not so much about doing a lot of kilometres, it is to speak with people, connect with the community,” he said. Tour de Rock is the biggest community charity event on Vancouver Island and it has raised over $24 million in the last 20 years. This year they are projecting to raise $1.25 million. This community event, which takes place between Sept. 22 and Oct. 6, is a team of emergency personnel who ride the length of Vancouver Island from Port Alice to Victoria, with a few detours to places such as Ucluelet and Tofino, raising funds along the way. When he went to the information session, SLt Leblanc was touched by the stories he heard about children undergoing cancer treatment. SLt Leblanc is paired with junior rider Jules, who is undergoing treatment for leukemia. Jules visited the base last month, sightseeing via a police vehicle and getting an impromptu tour of a submarine. While perusing the vessels on the jetty, a member of HMCS Chicoutimi’s duty watch asked if they wanted to come aboard. “It was completely unexpected,” said SLt Leblanc. Having a junior rider helps SLt Leblanc understand the difficulties of pediatric cancer. “I’ve had the chance this year to meet children with cancer and I saw what it does to them and their families,” he said discussing the financial and time constraints that it imposes and the difficulties for those on Vancouver Island, as it requires a lot of ferry trips to get to the children’s hospital on the mainland. For now, the spin-a-thons are done and preparation for the Tour de Rock continues. Until then, SLt Leblanc is thankful for the generosity shown by all those that donated over the last few weeks, including Quality Foods.